On an icy evening in February, my sister Yossy and I decided categorically that the time had finally come where we, as the mature and fiscally responsible adults we are, would book a family holiday. Our parents, Yossy and I, together under the sun relaxing... somewhere. We scoured travel pages for places we thought would be enjoyable for all four of us, it had to be somewhere with flavoursome food (for my dad), it had to be somewhere with a decent shopping scene (for my mum), it had to be somewhere aesthetically pleasing (for my sister). And for me... it just had to be outside of The UK. We aimed for Marrakesh and Ankara, but with the way, our bank accounts were looking (dusty and filled with regret), we ended up last minute booking the sunny city of Marseille. Our excitement peaked when we presented the booking confirmation in our mum’s Mother’s Day card. Everything was on course for what was to be a brilliant family holiday. Then life, as it does, deals you blows, I ended up losing my job around the end of May and the entire plan fell to pieces like piercing laughing shards of failure that stung and embarrassed me. My parents made the executive decision to abandon the holiday plans as they didn’t want me to spend any more money, but as things were already booked and paid for, I wasn’t about to let a blip in the landscape stop me from living my best life. So Yossy and I made a secondary executive decision to allé à Marseille, sans our parents and declare it a sisters trip. A few days after the Blogosphere blog awards, we packed an unholy amount of clothes into our very overweight hand luggage and jetted off to Marseille, nervous but wholly excited at the prospect of a sister-sister vacation, with the sting of failure still tart, dancing upon my chest in waves of blackness. Depression. We arrived at l’aéroport de Provence an hour later than expected (cheers Ryanair) and used my très mal française to purchase two coach tickets to the nearest métro station close to our Airbnb in the Vauban district of Marseille. 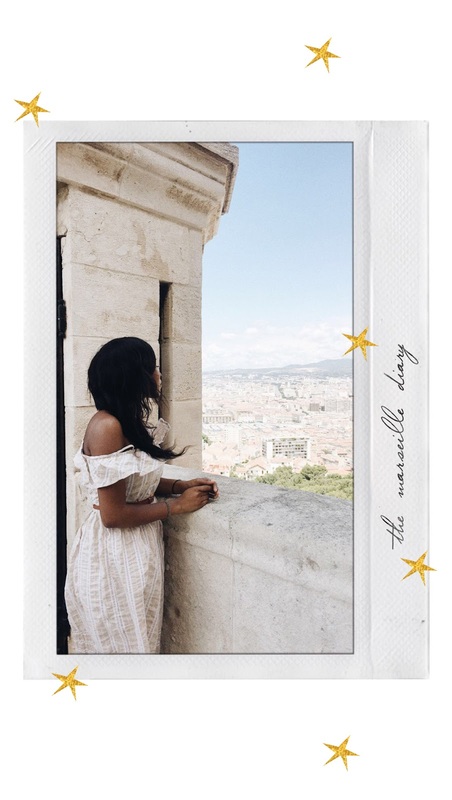 A breathless uphill walk and a few Instagram snaps along the way and we had arrived, our snug little Flat nestled on the eighth floor of an apartment building, with a framed view of the beautiful Notre dame de la Garde. On our first evening, we explored Vauban by streetlight and google maps, desperate for food and a nice glass of wine, we found a Vapiano’s, and promptly realised we didn’t know enough French to order at the counters aha! We walked and walked and eventually found a small Japanese bar and ordered food there. We sat outside, clinked our Aloe Vera drinks under the twinkling fairy lights and haze of second-hand cigarette smoke and drank it all in, we were in France, we were together and we felt on top of the damn world. Sunlight streamed through the windows at 7:00am the next morning and I sat cross-legged on the bed with a coffee in my hand and my wig damp from the dodgy shower I had had thirty minutes earlier. Yossy and I speedily got ready so that we could grab breakfast from a local bakery or coffee shop and experience proper pain au chocolat - French boulangerie style. We stumbled upon the most beautiful café in Vauban, a stone's throw away from where we were staying, called Les Succulentes, which merged, you guessed it - succulents, plants and all things green with delicious coffee, my kinda place. Two coffees and some pastries later... we went back to our Flat to get out of the heat for a few hours before going back out, on our way back we stopped by the little greengrocers opposite the Flat for some fresh Provençal fruit and vegetables. The owner Monsieur Rachid, a sixty-something year old Tunisian French ball of energy and enthusiasm, bumbled over to Yossy and I, declaring in French that he had a lot of delicious fruits for us to try, and so after many mouthfuls of strawberries, apricots and figs, we carried half a watermelon, and a bagful of other fruits, plus a few Provençal specials thrown in for free by the kindly Mr. Rachid on the premise that we were to come and say hi to him and the store every day of our stay. And true to our word, Morning, afternoon and evening we would go to say a cheery ‘Bonjour!’ To Mr. Rachid and his employees at the little greengrocers, it is here I should note that Mr. Rachid didn’t speak a lick of English, and our conversations were propped up by a mixture of my shaky a level French and a whole lotta google maps. One sunny morning on our way to a bakery to find more delicious pain au chocolat as usual, we stopped to say hi to Mr. Rachid, on this morning he excitedly greeted us with two kisses upon our cheeks and a ‘trés belle!’ We said hello to his nephew who helped man the store and Mr. Rachid insisted I left him my number as he would make a great husband for me and he thought I would make a great wife and a welcome addition to the family (aha! ), after this awkward back and forth in broken French (on my part) and flushed giggling from Mr. Rachids nephew, Mr. Rachid himself grabbed our hands and told us that he must take us for petit déjeuner at the bakery close to his shop and so we sat, the three of us, Yossy, Myself and Mr Rachid over coffees, quiche Lorraine and croissants learning about Mr Rachid’s North African roots, his children, his wife, his family (with the help of google translate of course). It was a moment that reminded me why we must keep traveling, keeping creating conversations and keep open minded. Eventually, we decided to hop on the métro three stops to the city centre of Marseille, a beautiful port, filled to the brim with vessels sitting on a sparkling shining blue-green blanket of water. The city centre was similar to most other major French cities I had visited in the past but it was laced with a certain je ne sais quoi (teehee had to get that in). The locals were exceptionally friendly and eager to share their recommendations with us. One thing everyone said we *must* try was the bouillabaisse (a Marseillais fish stew) and the Marseille version of fritto misto (fried seafood - sardines, squid, prawns etc), we tried both and I ate far too much of the fried seafood - it was delicious and super light! Another delicious delight we discovered were calissons, little almond paste and citrus peel sweets native to the Provence region. Not far from the city centre was the Panier district of Marseille, a mish-mash of small colourful alleyways, artisans, vintage shop fronts, art galleries and some very sweet cafés for a drink or two under the blazing yellow sunshine. Yossy and I waltzed around the Panier de Marseille as if under a spell, everything was so incredibly beautiful, people were so friendly, and the entire area was so aesthetically pleasing and so very French that I could have squealed. Would we return to Marseille? Absolutely, I think between the friendliness of the locals, the delicious food, the affordability and my harem of beautiful French boyfriends waiting for me (Aha!) I would most definitely make another trip there for a few lazy days in the Provence sunshine. Next time we promise to book it during the calanque tour season so we can swim in the crystal clear waters and experience the natural beauty of the south of France. Zut alors! this ended up being quite a wordy blog post didn’t it? I could have written and written and written, but it is now half past nine on a Sunday evening and I have had one too many glasses of merlot as I've been a' typing so I suppose this is where my post will have to end, before I wrap this up, I would heartily recommend a visit to the beautiful port city of Marseille. Oh my goodness, it looks like you've had a lovely chilled out time in Marseille! Exploring with google maps is about 100x better than the old fashioned way of using a map and guidebook! There really is something special about the slightly Mediterranean evening ambience over there, a little twinkle of starlight and it does feel magical. The seafood sounds delicious too and no less than I would have expected from a port city! This post is incredible Sade!